BEIJING (Reuters) - An eccentric Chinese recycling magnate said on Tuesday he was preparing to open negotiations to buy the New York Times Co .
Chen Guangbiao, a well-known philanthropist, is something of a celebrity in China. During a particularly murky bout of pollution in January, the ebullient and tireless self-promoter handed out free cans of "fresh air. But Chen says he is perfectly serious in his bid to buy the Times, something that he said he had been contemplating for more than two years. He said he expected to discuss the matter on January 5, when he is due to meet a "leading shareholder" in New York. "There's nothing that can't be bought for the right price," Chen said. As one of the most prestigious newspapers in the world, the Times is an occasional target among the wealthy -- some with unsteady aims. Donald Trump, the real estate magnate who sells Trump-branded bottled spring water, was trying to figure out a way to buy the Times earlier this year, according to a report in New York magazine, which said that details of Trump's plans were "scant." A spokeswoman for the Times said the company did not comment on rumours. 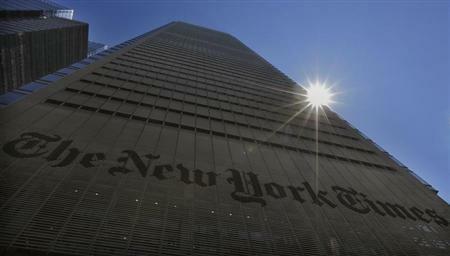 The company's chairman, Arthur Sulzberger, Jr., said recently that the Times was not for sale. Chen believes the Times is worth $1 billion, but said he would be willing to negotiate. The Times current market value is $2.4 billion. The New York Times Co, which once was a sprawling media outfit with TV stations, U.S. regional newspapers and ownership stakes in sports ventures like the Boston Red Sox baseball team and the Liverpool football club, is now down to its namesake newspaper. Shares of the New York Times were down 1 percent at $15.93 at midday on Tuesday, after earlier hitting a 5-1/2-year high of $16.14. The Ochs-Sulzberger family has owned the Times for more than 100 years and controls the company through a trust of Class B shares with special voting rights. "It's not true that everything is for sale," said Ken Doctor, an analyst with Outsell Research. "That is the reason why the New York Times has a two-class share system." Hurun's Rich List of China's super-wealthy put Chen's wealth at about $740 million in 2012. Chen said he would not hesitate to sell off most of his assets if it enabled him to buy the Times. But Chen said that because his funds were limited, he had persuaded an unnamed Hong Kong tycoon to put in $600 million while he would pay the rest. Chen said his aim was not to push any political agenda, but rather his personal ideals of "peace on earth, protecting the environment and philanthropy." He attracted attention in August 2012 when he bought a half-page advertisement in the Times stating that an island chain at the centre of a dispute with Japan had belonged to China since antiquity. "After that, I realized that the Times' influence all over the world is incredibly vast," he said. "Every government and embassy, all around the world, pays attention to The New York Times." The Times earned the ire of the Chinese government in 2012 with a report about the wealth of former Premier Wen Jiabao. The Times website has been blocked there since then. Chen said it was natural for the government to block the site because the report on Wen "contained biased and negative things that were not verified." "If I acquire the Times, the paper will only report the truth and must verify all information," Chen said, adding that he would like every Chinese household to subscribe to the paper. "As long as they have some influence, I'm still willing to consider buying lesser media outlets," he said.